Given that I was responsible for the conceptualisation of the first post war industrial zone – Atchchuvely – way back in 2008 and subsequently together with Industrial Development Board (IDB) and United Nations (UNOPS) funded by the Government of India, we were able to bring the idea to life by 2014, the UNP manifesto on industrial zones sure excited me. To utilise alternative energy such as wind power, wave, natural gases, solar energy. 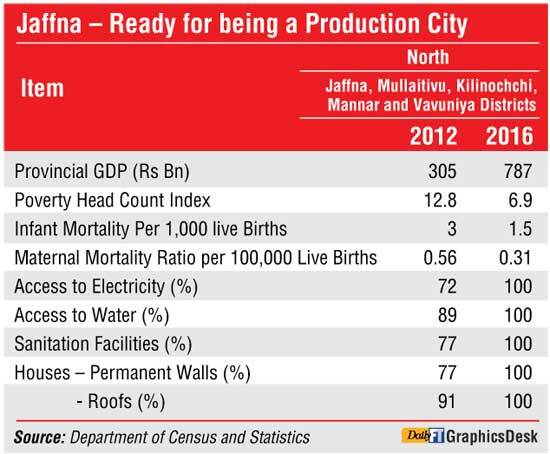 Jaffna – Next production city? In this background I strongly feel we must make Jaffna the next production city in line with the UNP manifesto so that we give a new meaning to the post-war economic agenda of Sri Lanka that will also give meaning to the diaspora that Sri Lanka is positively engagement together with delisting of the banned organisation by the Government. However, making Jaffna a production city will require some key changes to the culture of Jaffna given that the simplicity of the people of Jaffna is so unique and stands out very strongly. 84.9% of those livening in Jaffna own a bicycle as against the national average of 39.8%. This reflects the pace of life in the peninsula and perimeter of life of a typical household when it comes to visiting friends, purchasing day-to-day grocery products and the circle of life. In my eyes this is the beauty of the people of Jaffna and must be preserved to maintain its identity. If one visits the most exclusive ice cream hideout in Jaffna, the Rio Ice Cream Parlour – which in fact the IDB Chairman and I visited on the day of the opening of the Atchchuvely Industrial Zone last month – it depicts the simple joys of life that a kid experiences on a Saturday evening. All ice creams are made with liquid milk and the combined with natural fruit and has the potential to give a run to retail brands like Elephant House or Cargills in the years to come. If one visits the Jaffna Library, all remove their shoes before entering the premises, which signifies the respect the people have for education and the world of knowledge. Most Jaffna families believe that next to God is education and kids go for tuition not in the afternoon like the practice in the rest of the country but one begins at dawn around 5 a.m. in the morning. If one examines the statistics, Jaffna depicts the lowest on those who have not attended school at just 0.9% as against the national average of 4.6%. Even on the segment of those who attend school up to Grade 5 and on the segment Grade 6-10, we see that Jaffna scores way above the national average. To be specific, on the latter segment the national average is 16.1% but the Jaffna number shoots to 52.9% on those attending school. This clearly signifies the strong and disciplined approach of thinking that one gets exposed to and is inculcated from an early age. But the scores on the O/Ls and A/Ls are below the national average and this will naturally increase given the recent investment by the private sector with programs like CIMA and degrees. After all, the best brains on accountancy have originated from Jaffna in the yesteryear. This will sure become the trend in the near future is the thinking of the experts. If I may track back on the history of Jaffna briefly, Jaffna was originally called Yalpanam. The suburbs of Jaffna is Nallur and was termed the Jaffna Kingdom for over four centuries. Way back in 1981, it was the most populous city next to Colombo but as per the latest data of the Department of Census and Statistics as of March 2012 the number recorded is 583,017, which in fact can be termed petite and beautiful from a very artistic perspective. Historically, Jaffna was under Portuguese occupation in 1619 whilst in 1796 it turned to a blend of Dutch rule that brings in the colonial architecture to the city. In 1948 with Sri Lanka earning the right for independence, the people of Jaffna ruled the peninsula. In 1986 the LTTE occupied the area and once again from 1989-1995 whilst the IPKF had a rub off on the people in 1987. But the people of Jaffna had their own unique culture and the peninsula began to blossom since 17 May 2009. We are now seeing the real beauty being unearthed that is poised to be the Bali of Sri Lanka is my pick up. The detailed architecture of Jaffna is very interesting. The senior citizens constitute 11.5% of the population which is below the national average of 12.3%. It is also fair to say the population of Jaffna is young in nature and it gives a vibe of the new investments and opportunities that the peninsula can absorb with strong drive. The reason for the strong drive can be justified by the fact that the poorest 40% account for 18.3% of the population which is way above the national average of 13.3%. 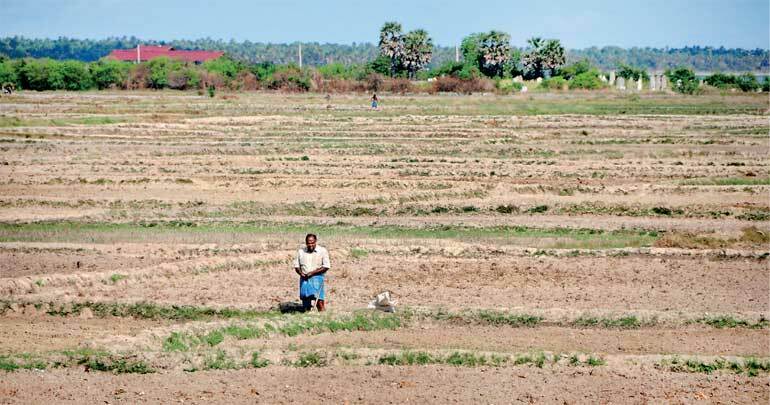 Even if one looks at the richest 20% of the population of Jaffna, it is at a low ebb of 44.1% as against the national average of 54.1%. I believe this will change drastically given the key changes we see in the Northern Province as per the Ministry of Finance. 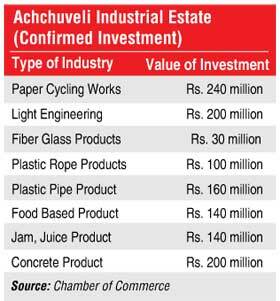 With the shaping of the Atchchuvely Industrial Estate, maybe the next step is making the twelve companies that have been starting business and selecting the rest from the 51 applications the winning businesses which will get access to the industrial estate. Thereafter the positioning of the estate as the first green industrial estate can be the birth of the industrial revolution into the peninsula. Maybe the next will be the setting up of a BOI zone in the years to come equipped with state-of-the-art warehousing and container trafficking via the A9. This will add to the theme Jaffna – the next production city.